Sonic Pinball Party had a variety of pirate boxes floating around, despite the game getting an American release first, they decided to make horrible mock ups of the final box. These boxes have two things in common: They all use the generic, 'basic' versions of the Sonic gang, AND they only have the Sonic gang, no pictures of NiGHTS or Amigo, which are parts of the game boards and are on the front of the final design. This box is the 'Japanese' styled pirate box, despite at the time the Japanese version not being released yet, this was still floating around. 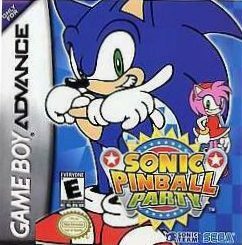 The third version of the pirate box uses the Pinball Party artwork, but has the Japanese logo on a US box, and they're thrown in Cream for no particular reason. 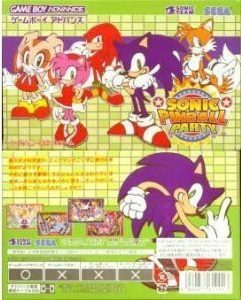 The fourth box has the correct logo and artwork of Sonic, but it missing the background NiGHTS and Samba De Amigo characters.